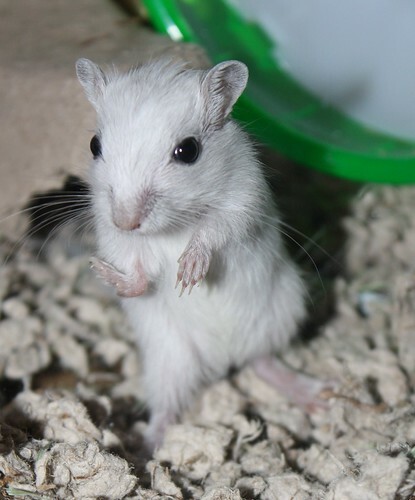 Back when Stimeyland experienced its gerbil population explosion, I noticed within the first few days that one of them had an arm disability. One of the little girls had a twisted hand so I made sure to give her a super tough name and I sent her out into the gerbil world. Delightfully, she always looked like she was waving. Spike did great in life, foraging for seeds and chewing up cardboard with her sisters and her mom, but sadly, she is the first of the babies to leave us, a little more than two years after her most exciting debut. You were a very good and very tough gerbil, Spike. You will be missed. It must be gerbil farewell time of year. We lost Tony last week and wee Bruce went off to join him in that great gerbil tank in the sky just yesterday. Fortunately the other two both seem fit and well so far. They are two years old too, so that must be the age when they start feeling their age I guess. I'm so sorry to hear about Tony and Bruce. It's sad to lose them.